In South Asia, particularly India, more than half of the population consumes unsafe, contaminated and polluted drinking water. Due to poor water quality the occurrences of intestinal diseases are wide spread and households spend substantial portions of their income every year to cope with the diseases. Boiling the available water is a major expense and not a common practice of most of the households in India. Often many households buy bottled water fearing diseases and end up spending unnecessary additional money from their small incomes. In recent years the market for various commercially manufactured filters has grown in India. These filters are far too expensive for most of the Indian population. The WHO and CDC estimate 3.5 million people die per year from water-borne diseases, the #1 cause of death worldwide. This amounts to 10,000 people per day, among which 4,000 are children. To address this issue on a mass scale, a Canadian scientist, Dr. David Manz, developed a Bio-sand Water Filter that is inexpensive and effective in removal of dissolved particles and pathogens from contaminated water. The Bio-sand filter is a type of slow sand water filter specifically designed for removing disease causing organisms with intermittent operation. 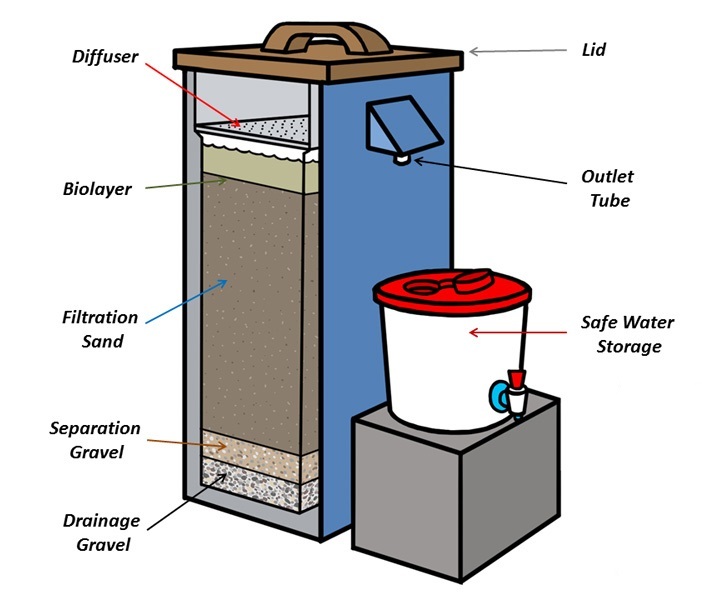 The filter is composed of a cast concrete container with layers of sand and gravel and a naturally occurring biological layer in the top few centimeters of the sand layer. The Bio-sand technology has been introduced in more than 50 countries and is widely in use. The filter has been tested by various government, research, and health institutions, as well as by non-governmental agencies across the world and found to be effective in water purification. The filters are effective at removing 98% of bacteria, 100% of viruses, 99% of protozoa, amoebas, metals, and worms, 95% of iron, and with a slight modification, 93% of arsenic. Once contaminated water from various water sources such as rivers, lakes, wells, ponds, and rainwater runs through the filter, illnesses such as typhoid, cholera, hepatitis, e-coli, dysentery, among many other viruses and infections, have dramatically reduced in regions where this is being utilized as reported by hospitals in rural areas. The filters can be built on a small scale at low cost. There is no electricity required, no chemicals used, and no replacement parts, therefore no on-going costs for the user. Once installed, the filter will last 30 years, producing 300 liters per day of safe drinking water, enough for 15 rural villagers to use daily. The cost, when made in Kolar India, is approximately $45 per filter, a one-time expense, which includes manufacturing, delivery, and ongoing support. The villagers are then able to use it for 30 years. South Asia Pure Water Initiative, Inc. (SAPWII) was started by a husband and wife team with Peace Corp and Rotary backgrounds who want to make a difference in the lives of people living in South Asia. A startup grant was obtained from a foundation in Connecticut which allowed the organizers of SAPWII to start a small factory in Kolar, Karnataka, India in November 2005 to manufacture the Bio-sand filters. To date, SAPWII has distributed 10,000 filters, thereby transforming lives of 150,000 villagers. The filters have had an overwhelming acceptance in South India and have been placed in many households, schools and businesses. However, the need for filters in India is in the millions. In an effort to spread the awareness and technology at a faster rate, SAPWII is conducting professional Bio-sand Filter training sessions to leaders of NGO’s (non-profits) in India in January & February 2014. The trainings will allow NGO’s to start building and distributing filters in their regions of India and South Asia. The project is being coordinated by Shivani Kumar, a Los Angeles resident of Indian background who has a vision of providing clean drinking water to all…Helping People One Drop at a Time.